Dexter shares a snack with me while we wait for one of my specialist appointments. He is a coffee cake hog. From second trimester on, my pregnancy with Cricket is under the care of the U.K.’s National Health Service, aka NHS England. Matt still works for a video game company and therefore receives private health insurance, but after some research, we discovered that NHS care would be comparable and in some (boring) ways, better for us and our situation. For the uninitiated, the U.S. has no national health service. All of my care was provided in private practice, via employer-provided insurance, paid for by us in the form of a paycheck deduction. The NHS in the UK is most similar to a single-payer plan, but does not truly fall under that definition because in addition to being paid for via our taxes, there are trusts involved and as mentioned, private insurance is in the mix. My comparison of the two will be tempered by the fact that I’m a special, high-risk, old-lady-mom snowflake. My age, infertility and late miscarriage are all things factored in when doctors and I are making decisions about my care, and we also did NHS stuff a little out of order because of when we arrived in the UK. I’ll mention when and how those affect the comparison. Yeah, they’re just called different things. As mentioned, we had fantastic health insurance in the U.S. But it still cost me $10 – $30 per visit. Not a horrible cost, except when you’re as high risk as I was, you’re seeing a doctor on pretty much a weekly basis, and that’s before the visits ramp up toward the end. It added up. Dexter rearranges the waiting room (here it’s called reception room) furniture to be more in line with his aesthetic preferences. This is one of the ones I did a little out of order. I have a midwife now, and I’ve seen her twice and she’s cool. She may or may not deliver Cricket – there’s a rotating slate of midwives at the hospital. I had an 8-week scan before leaving the U.S. and my fertility doctor found a blood clot, so he recommended I get an ultrasound ASAP in the UK. That meant first thing, I visited my GP, who referred me to a specialist to perform the ultrasound. (I’ll get into the ultrasound differences next.) We also prioritized another specialist (based on miscarriage) who I met with a few times, and all of these things just fell in line before I could see my midwife. That’s quite unusual – usually, midwife is who you’d see first, and you would make decisions about specialists and antenatal care together. In the U.S., the OB is captain of the ship. In my case, it was a little different – I was also seeing a designated high risk doctor, and a lot of his checks overlapped what the OB would do, anyway, so we dropped some of the OB stuff. The high risk doctor essentially became captain of my ship until I “graduated” from his care, at 37 weeks six days. I went into labor later that very day. Okay, I’ll admit I haven’t taken inventory in every single US OB’s office, but I sure haven’t heard of anyone having to go elsewhere for their ultrasounds. Feel free to correct me in the comments if I’m wrong, but it’s my impression that every OB has an ultrasound machine, and they frequently offer additional services like keepsake DVDs and 3-D ultrasounds. 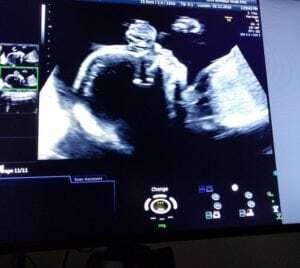 A photo of a rare Cricket ultrasound. This one is a few months old so he’s EVEN CUTER now, if you can believe that. In the U.K., the midwife (who practices out of my GP’s clinic) and the OB (it’s unusual to even regularly see an OB, but he’s sort of my “high risk” guy here, and he practices out of the hospital where I’m to deliver) only use Dopplers. I travel to a special antenatal and fertility office near a much bigger hospital than the one where I’m delivering, because that’s where a good ultrasound machine is. I got ultrasounds all the time in the U.S., and we always walked out of there with fistfuls of printed photos. Here, I’ve had a few internal ultrasounds and a grand total of two regular ultrasounds, and I’ve only had that many because of my risk factors. Not only have none given photos, but they actually have a little sign up asking partners to have mobiles ready to snap a pic from the screen, should you want one. The sparser approach doesn’t bother me, but Cricket is probably going to wonder why we have 1,000 ultrasound photos of Dexter and none of him. The stirrups always felt sort of clinical and degrading but as it turns out, it’s more comfortable to have a place to rest your heels. In the U.K., all of my internal exams have happened on a regular flat bed thing. There’s a lot of scooching and adjusting. This one is more fascinating than it sounds. In the U.S., you may or may not get an appointment reminder via phone call, text, email, whatever. If you miss an appointment without properly cancelling, you can be charged a fee. In the UK, I get a letter in the mail well ahead of my appointment (if there’s time) and a text reminder a day or so before. The text makes a point of telling you how much it costs the NHS if you no-show! Also, sometimes here you’ll get a letter telling you to come to an appointment you haven’t made. It’s a little disconcerting. In the U.S., you likely fill in a long form your first visit, and answer a bunch of questions. On subsequent visits, the doctor references a database with your files to discuss your care, and occasionally, you’re asked to fill in a new form. In the U.K., the only form I’ve filled out is at the dentist office, which is a whole separate system. For my antenatal care, I was asked a bunch of questions and they used the answers to create a tangible file, which is in a folder I carry with me to each appointment. They add records at each appointment, as well. Funny story – some receptionists call this your “note.” The first time I was asked to hand over my “note,” I assumed they meant the appointment letter, because to me, a folder isn’t a note. I launched into a long explanation about how I was new to the country and some of my appointments have been rushed or out of order and therefore I didn’t receive a letter for that appointment and the receptionist had a very long, confused discussion before I finally realized what she meant by “note.” I don’t mind this system, although sometimes is makes me nervous to carry around my medical records. For me, this is probably the single biggest difference in care. Because of my age and previous late miscarriage, my US doctors slapped high risk label on me and I wore it for the whole pregnancy. Every decision was made under that designation: I had a voluntary, preventive procedure, lots of extra monitoring, and I was only permitted to deliver in a hospital. In the U.K, they took some precautions based on my past. Rather than have the aforementioned procedure, we opted for extra monitoring (and I was a much more vocal part of the decision), and once we were clear, that aspect of high risk was erased. I had another bump in the road during my second trimester based on an abnormal test result but again, once additional testing showed no issue, that was that. They’re not treating my age as a risk factor because I’m pretty healthy – so unless there’s a reason to make advanced maternal age an issue, they don’t. I’m eligible to deliver in a birthing centre here, which is still amazing to me. In the U.S., mothers are weighed at nearly every single appointment. I’ve never been given feedback about my weight while pregnant in the U.S., but I know other moms whose doctors have expressed concern that they’re gaining too much or not enough. In the U.K., I was weighed twice, once at the OB and once by the specialist. Because of this, I know I didn’t gain for a few weeks in the beginning, but no one commented on it and I chalked it up to stress of move and more walking. I haven’t been weighed since. It is simply not a factor. It’s very freeing. Pass the cake. In the U.S., scheduling a tour of the hospital was a big deal. There were only so many spots per tour, so we booked online, and it was comprehensive – they covered everything from where to park to delivery room to recovery room to visiting hours, with lots of questions and answers and a gift bag at the end. And we did, then we and the dozens of other couples wandered around the ward, peeping at the waiting rooms and stuff. And it was fine. Just a really different experience. Overall, the hospital provides far less in the U.K. In the U.S., pregnant moms are often advised to take whatever they can get their hands on – pads, big undies, water bottles, blankets, baby hats, etc. – because you’re paying for it so why not? Here, we will have to pack a much more comprehensive Go Bag because very little is gratis. In the U.S., this care mostly shifts to a pediatrician, which now that I type that out, is a little odd. You see a pediatrician a few days after birth, get the baby checked out, and it’s clear they’re checking out the parents at the same time. Moms don’t get an appointment for them until 6 weeks later, when an OB makes sure everything is healing okay and usually does some mental health screening. While of course moms concerned about PPD can reach out for care, it’s notoriously difficult, and no one stops by or anything unless special arrangements are made. In our case, in the U.S., we’d hired a doula, and it was part of our contract that she stop by. It was truly great to see her and now I feel fortunate to get a home health visit standard after Cricket is born. There are some exceptions – I imagine if I was really having issues and in denial about them, the NHS would become more forceful. But overall, in the U.K. I have a lot more control over my care, what precautions we take, what we do. In the U.S., and this is also partly due to it being my first pregnancy that got past 20 weeks, I was much more along for the ride, letting doctors dictate my care. What is interesting is that neither approach is definitively preferable – it just depends on the personality of the patient. What is even more interesting, in my particular case, is both times, although the care is vastly different, I feel like I’m getting exactly the care I need. In the U.S., it was my first pregnancy after a traumatic miscarriage. I was really scared, and perfectly happy to let my medical team dictate what needed to be done to make sure Dexter arrived. Although it was more expensive and all that preventive stuff and extra monitoring took a lot of time, it was worth it, because it eased my mind and because Dexter is here, healthy and wonderful. In the U.K., not only does the pregnancy feel less risky, but I’m more confident because I’ve done all this before. With Cricket, I’m relieved that doctors are less aggressive and I was really happy to be able to decide to opt out of some of the preventive and extra stuff. 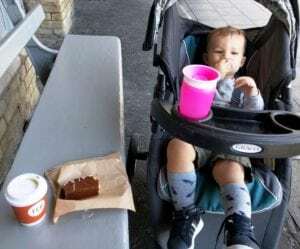 This time around, I’m glad that instead of constantly going to screenings and scans, I can spend this time hanging out with my son, before things get a lot more hectic and crowded around here.